- You can build whatever you want, but can only use scrap wood. 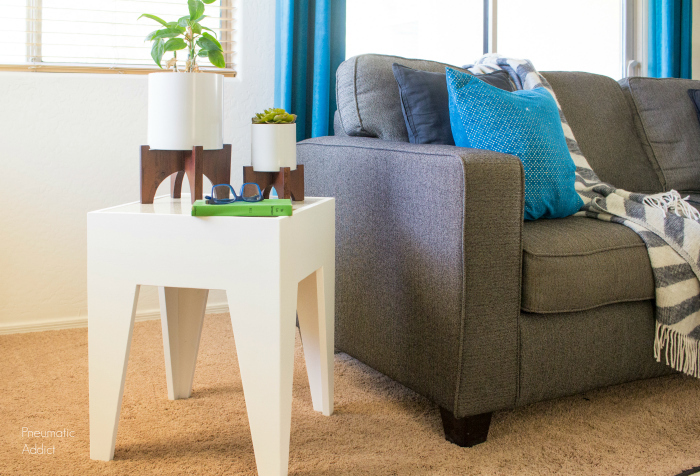 No new lumber can be purchased, but fasteners, paint, and that kind of stuff are okay. 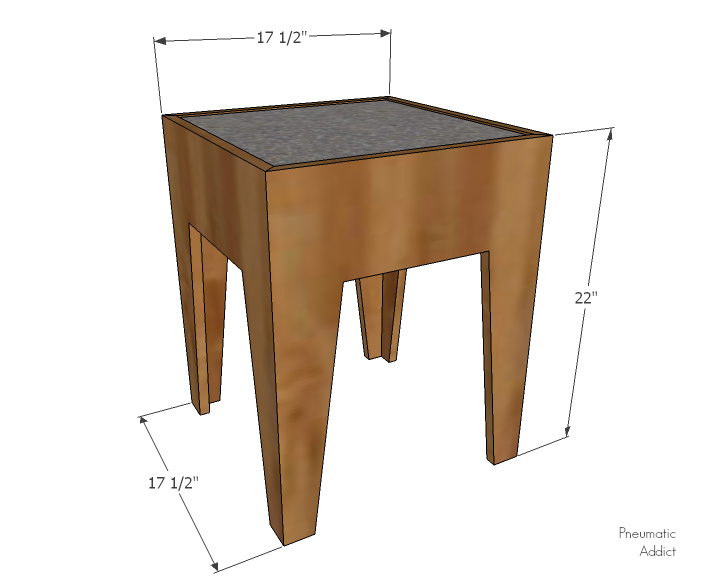 Scroll to the bottom of the page for links to the rest of the maker's scrap wood projects. 1. Since the resin takes at least 24 hours to cure, it's a good idea to make the table top first. 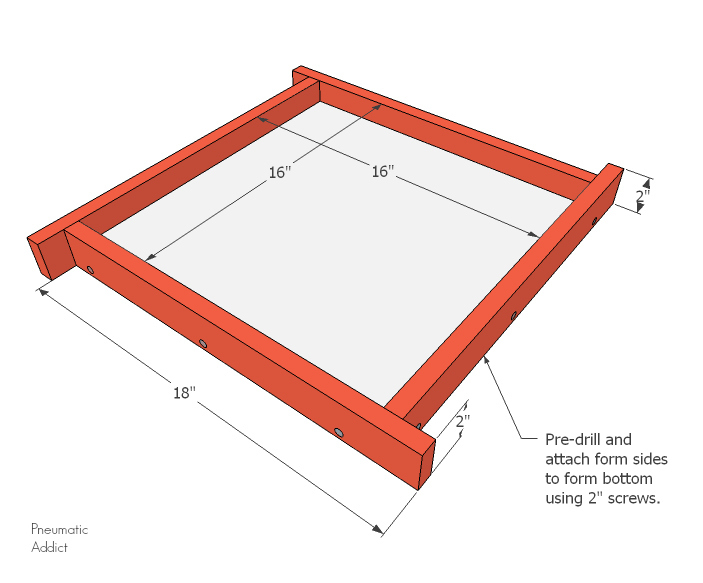 You will need to make a simple form out of pre-cut 3/4" melamine pieces. Pre-drill and attach form sides to form bottom using 2" screws. 2. 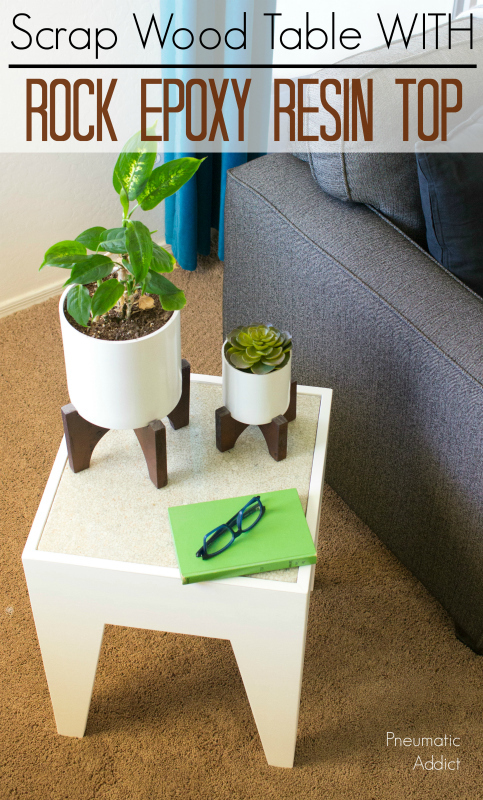 Following the included directions, mix 2 quarts of epoxy resin in a disposable container. 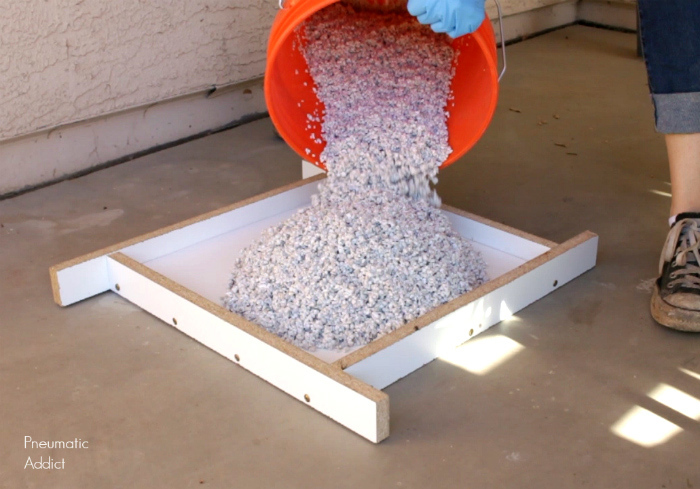 In a 5 gallon bucket, combine aquarium gravel and resin. Mix thoroughly and pour into prepared form. I used four, 5 lb bags bags of rocks but if I were to make this top again I would use only 3 bags instead. 3. 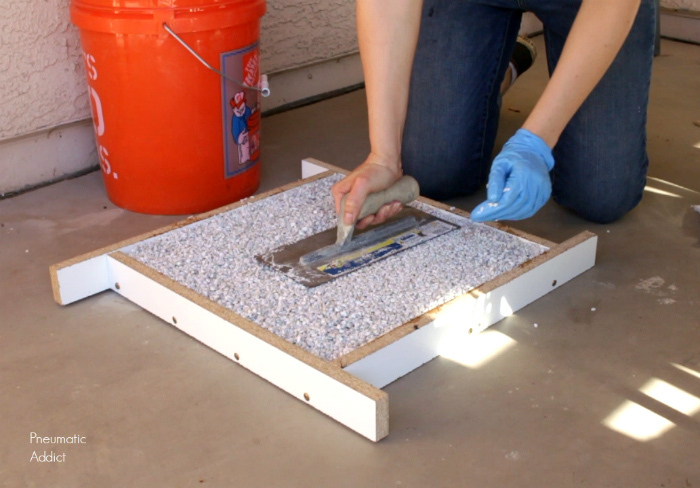 Use a trowel to tamp and flatten the gravel mixture. Pay close attention to the corners. 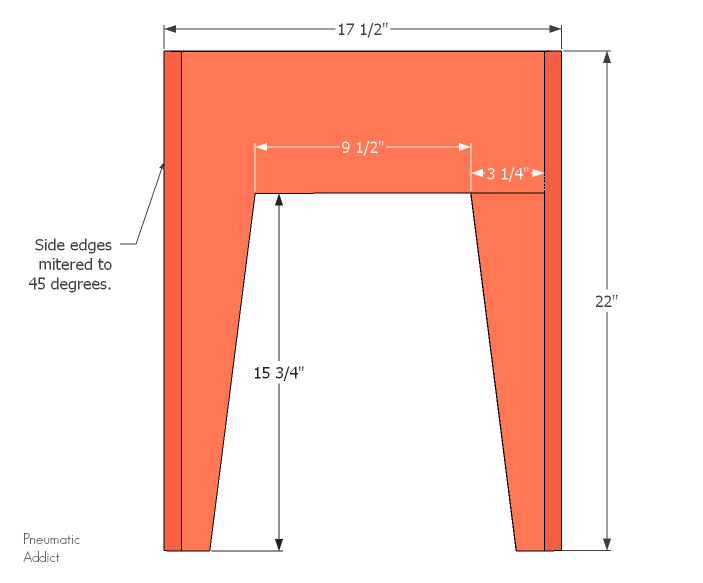 Use a table saw or circular saw with a track guide to cut four, leg panels. The top edge and inside cuts should be made with the blade set to 90 degrees, but the vertical, outside edges need to be cut with a 45 degree bevel, short side facing in. Apply wood glue to the mitered edges. Join all four sides of base together. Secure using 2" brad nails and ratcheting straps while the glue dries. 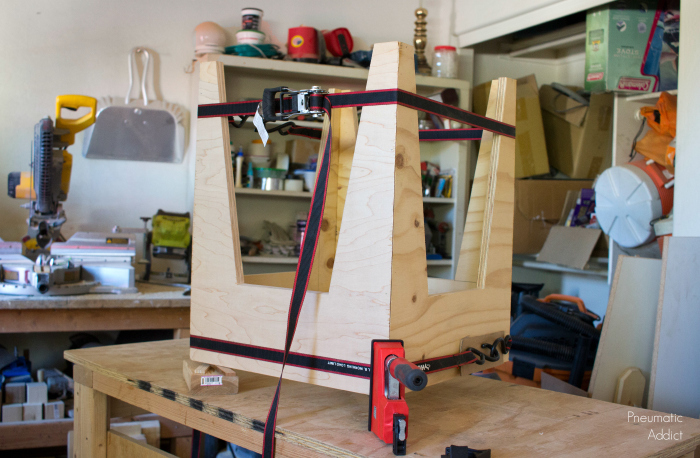 When the glue has fulled dried, remove the base from the clamps. 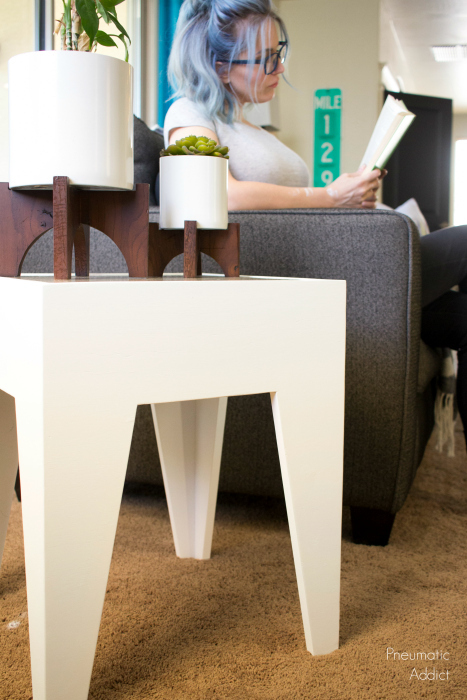 Ascribe a line 1-5/16" from the top edge of the base. 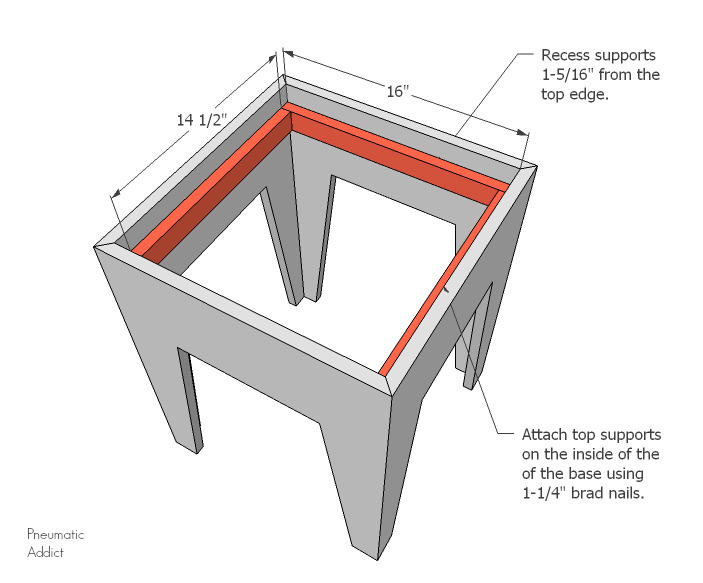 Attach top supports on the inside of the of the plywood panels using glue and 1-1/4" brad nails. 1. 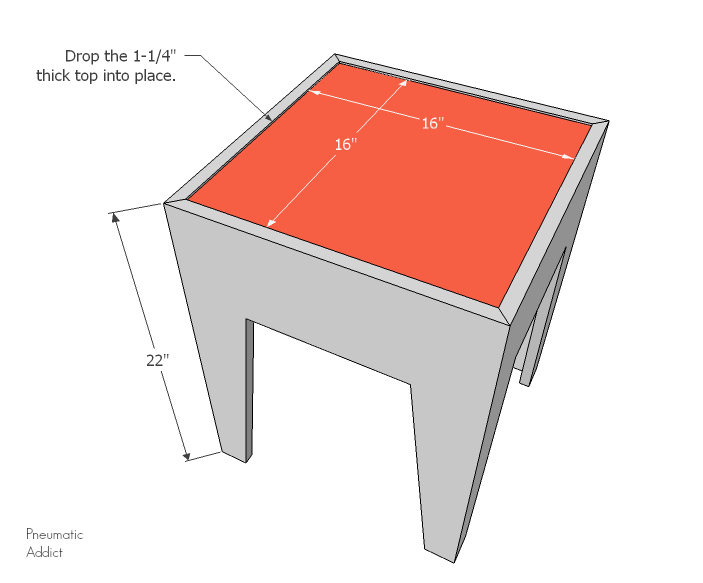 Apply your desired finish to the base and carefully remove the table top from the form. 2. 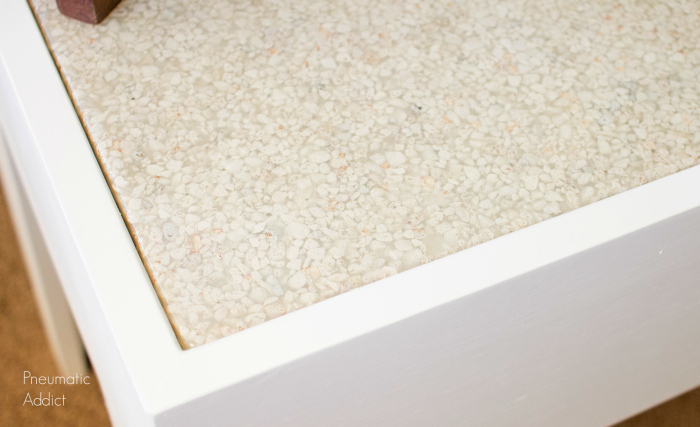 The melamine form has a very subtle texture, which leaves the resin smooth, but with a satin finish. If you'd like a shiny look, it's not difficult to polish the surface to a high gloss - with the right tool. 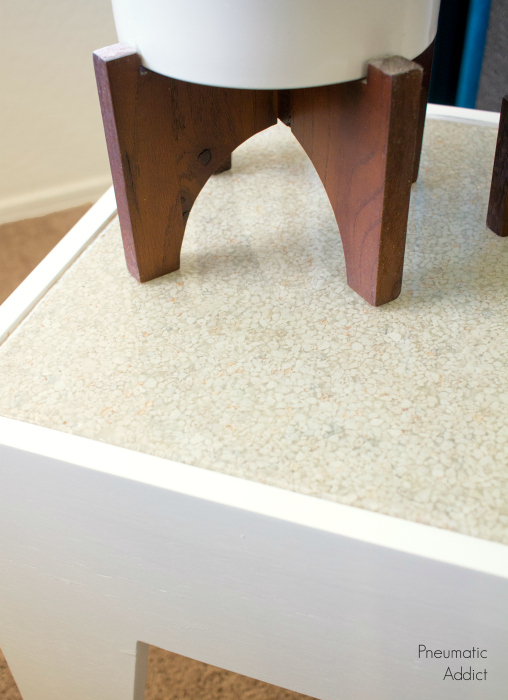 Using sandpaper, progressively sand the surface of the top up through 2000 grit. Next, use a buffer or rotory tool and some automotive polishing compound. 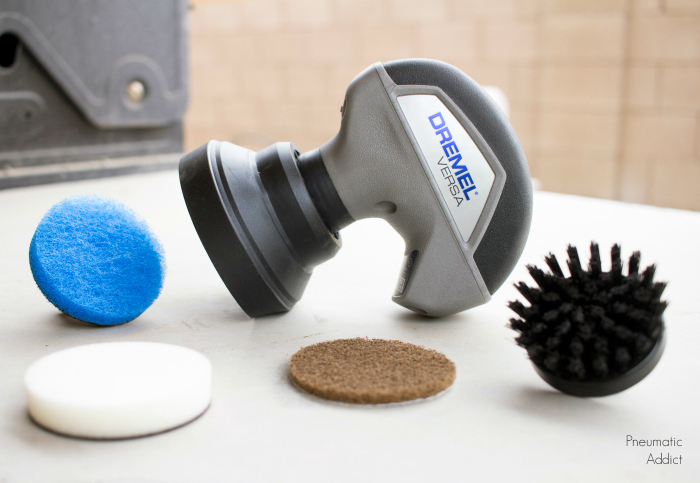 I have a Dremel Versa cleaning tool and I thought it would be perfect for the job. It's a spinning power cleaner, normally used for scrubbing tough grime, but I discovered it makes a great polisher/buffer for small jobs. It's rechargeable battery allows for strong and consistent speed to tackle a whole slew of jobs. 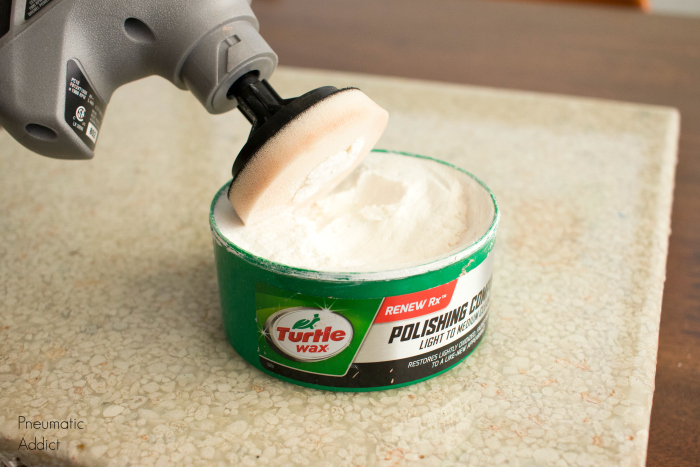 I spread a good amount of polishing compound on the soft sponge pad, and used the Versa to buff it evenly into the table top surface. When I was done, the resin shone like glass and gave the top the look of polished terrazzo floors. Carefully lower the top into the opening and rest onto the supports. The top should be a tight fit, but if if you have gaps, you could fill them in using clear caulk. That's it! 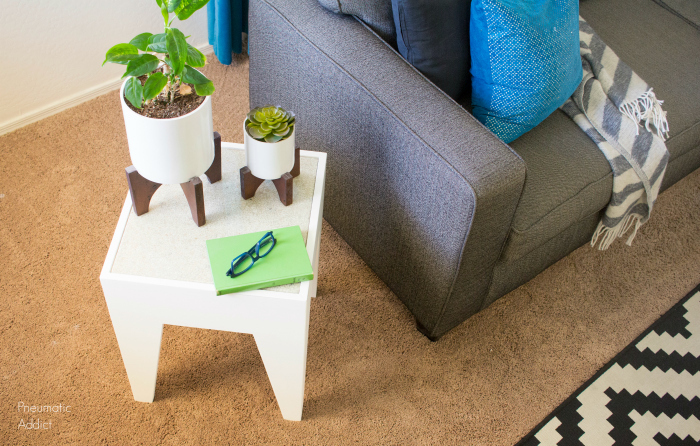 Move your new table into place, find a good book and enjoy! I'm so happy with the way my resin and rock experiment turned out. It's hard to capture in a photo, but I love the visual depth of it. I'll go MUCH MORE into detail about the resin top in next week's video! It feels so good to get some of that leftover plywood out of my shop. I think I'll try this base design again. 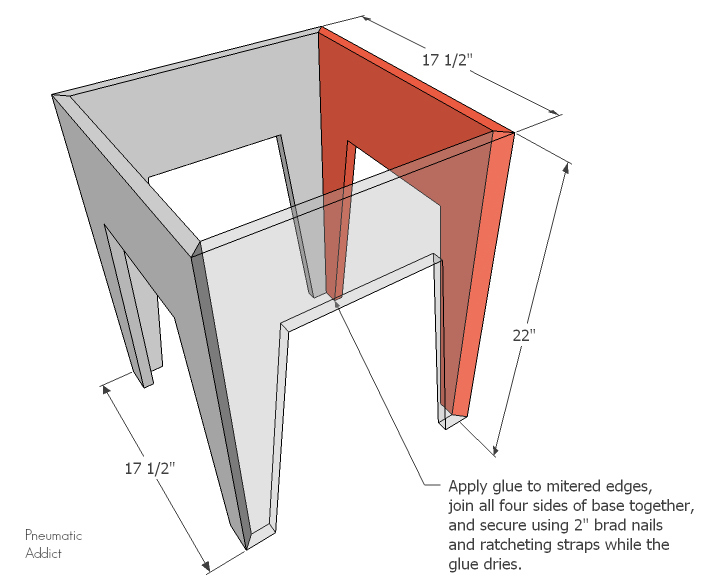 The idea of four mitered sides is so simple and easily modifiable. The panel shapes and sizes can be changed to to whatever look you want. Don't like the rock resin top? No problem, just move the height of the supports and use whatever material suits you. I have a lot of creative friends and you will not believe what they have come up with from their wood scraps! Make sure to click the links below and check out all of the Scrap Wood Challenge entries. Feel inspired? If you have any questions, please leave a message in the comment section. Pin the image below to save this idea for later! I love all these project experiments you do. Another awesome idea!